What a cool thing to do of a summer Saturday afternoon in Chelsea, right? So, after meeting friends for brunch, we head over to the far west side on a street full of interesting art galleries (who knew?) and then into a loft building. An attractive young woman outfitted in a beautifully tailored Air France uniform greets us. 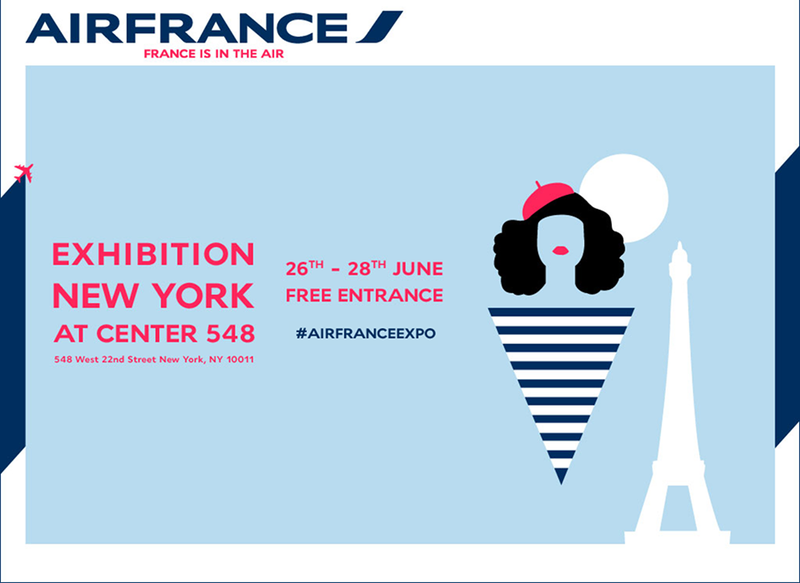 In fact, as we move through the exhibit, there seem to be dozens of Air France uniforms all around us, smiling, helpful and very welcoming. And what, exactly, is the exhibit? 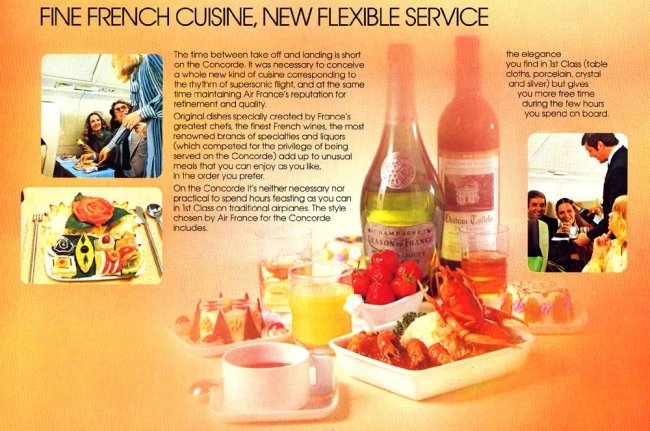 Throughout, you see Air France memorabilia: photographs, videos, samples of their beautiful crystal, china, silverware, etc. There’s also fun, silly stuff to walk through. Even a kids area where they can play and run around while their folks ogle the exhibit. But, mostly, as you work your way through, you can sample the various cabin classes on board, which is the real purpose of the exhibit. 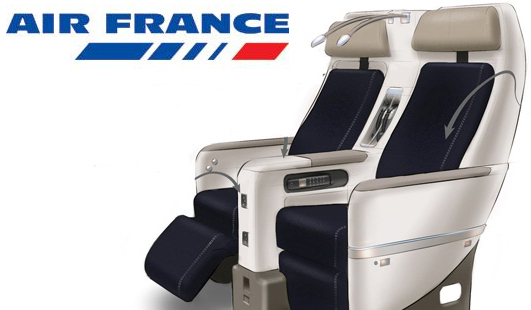 Air France wants to put butts in seats. In fact, if you want to try out the seats, go for it! We start in economy (meh) – looks like lots of seats pushed together. 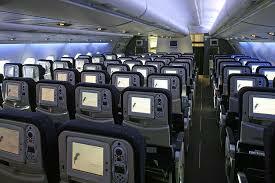 Premium economy is next – getting better, as there’s a bit more legroom – 6 inches more pitch. Business? Now we’re getting warmer, the seats are comfortable but, also, angle-flat, not flatbeds – phooey!! See what I mean about “angle-flat”? And then it happens, you go through a curtain and, suddenly, you’re in first class (a/k/a La Premiere). And you gasp just a little bit and your heart may skip a beat. It’s magic time. 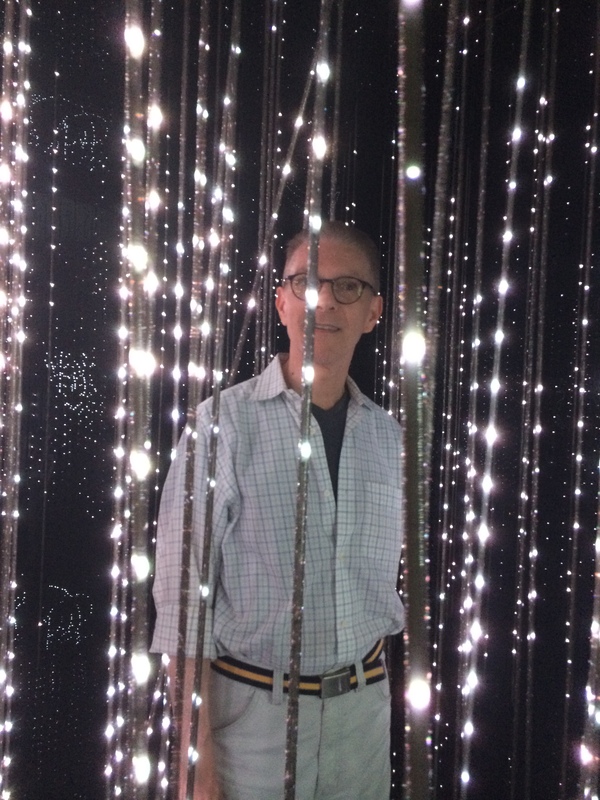 La Premiere – Pretty swank, huh? Wouldn’t you just know? This is the one cabin of the plane where you can’t sit in the seat!! “Make ‘em beg for more, and then DON’T give it to them!” The creeps! 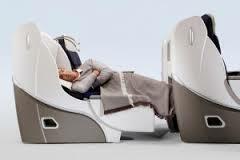 After seeing the first class cabin, there’s nowhere to go but down. Literally, that is, as it’s the end of the exhibit. But on the way out, those cute AF uniforms give you posters and the best ice cream sandwich ever. And both are yummy. So are the uniforms, come to think of it. Yes, gentle readers, AAC CPA knows how to push-my-buttons. First thing: When, exactly, is the show playing in Paris? 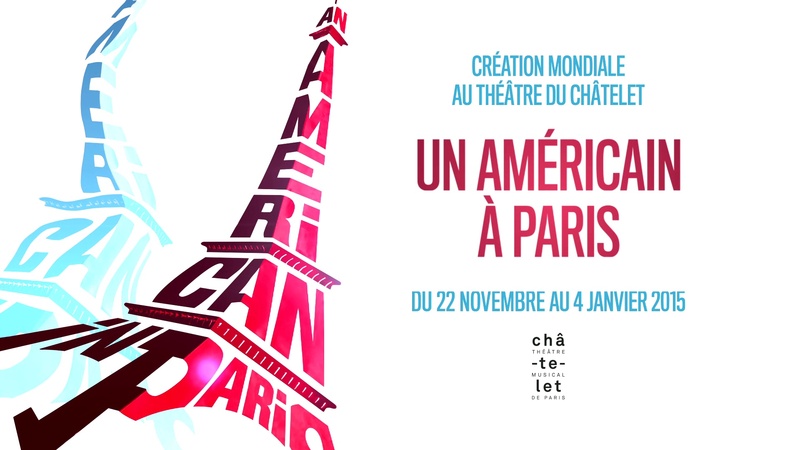 Easy enough to find out, just go to the Châtelet website and – wait for it – OMG: it’s playing over the holidays. Are seats even available? How about 10th row center on Christmas Eve?? Woo-hoo! Hold that thought. 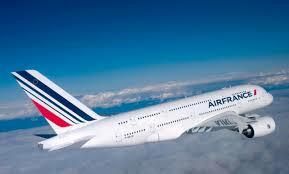 Next: Take a big breath and head over to the Air France website and find out what’s available for a round-trip to Paris over Christmas week. It’s the holidays, so it’s going to be difficult to get seats, right? What I see stuns me. 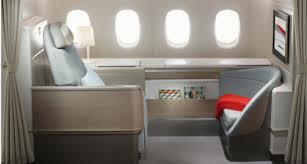 Based on what we’ve heard, flying on Air France in first class (excusez moi – La Premiere) has been a bucket list fantasy dream for a long time. But we couldn’t possibly – the fares would be over-the-moon-too-expensive-out-of-our-budget-impossible. But wait, for some unexplained reason, the fares over the holidays have been discounted by something like 70%. 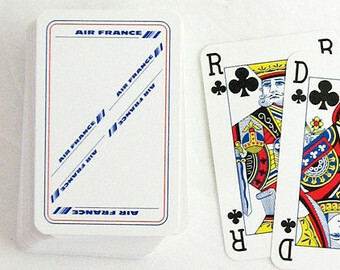 And, on top of all that, we’d get to fly on the new A380. Whaaaaat? Do my eyes deceive me? Apparently not. Now, I’m not going to lie and tell you that it wasn’t beaucoup bucks but, on the other hand, who doesn’t want to take advantage of a great deal, at least once? Reminder to myself: How lucky are we that we could even consider such an indulgence? And in a couple of mouse-clicks – I had windows open for both Air France and the Châtelet – we locked in our fantasy holiday trip: We were going to be two Americans in Paris, seeing An American in Paris on Christmas eve– IN PARIS! Seriously, how lucky ARE we?? Who doesn’t love flying First Class. What a fabulous report on your trip to Paris! I can’t wait to read about the inflight experience. Hey! Thanks for the comment – Full agreement here. Flying AF was a bit of a game-changer and made us really appreciate how lucky we were to be able to make that trip!